Sea snakes trace their roots to a group of highly venomous elapids that became marine organisms about 30 million years ago. Banded sea snakes -- one of roughly 70 species of sea snakes -- have evolved the ability to dive for lengthy periods, as they hunt eels hiding among the rocks. Nevertheless, sea snakes are air-breathing reptiles that must return to the surface periodically to replenish their oxygen stores and expel waste gases. People apply the name “banded sea snake” to a number of marine snakes, but most commonly it refers to the banded or yellow-lipped sea krait (Laticauda colubrina). 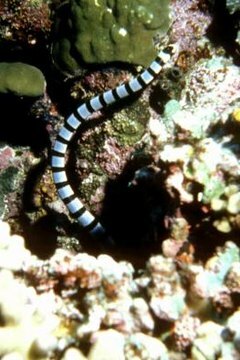 Sea kraits are the most terrestrial of the sea snakes and have retained the ability to crawl on land. While most other sea snakes have lost their ventral scales entirely -- making them helpless on dry land -- sea kraits have retained some ventral scales, enabling them to crawl on land. In contrast to the live-bearing habits of most "true" sea snakes, sea kraits return to shore to deposit up to 20 leathery eggs. Banded sea kraits are prey specialists who hunt eels almost exclusively. Like some other aquatic species, the sea kraits exhibit gender-based dietary differences. The females, which grow much larger than the males, primarily consume large eel species, while the males prey on small eels. Because their prey often represents a large portion of their body mass and reduces their swimming performance, sea kraits usually return to land to digest their food. When sea kraits dive, they can remain submerged for a long time. By using an extended portion of their lung -- termed a saccular lung -- to hold air, sea kraits can dive longer and alter their buoyancy as necessary. During feeding excursions, sea kraits spend about 80 percent of their time underwater. Diving as far as 260 feet below the surface, the snakes often remain underwater for more than two hours. When surfacing to breathe, the snakes only pause for about 45 seconds before submerging again. Barnacles frequently colonize the bodies of sea snakes. To combat the problem, sea snakes shed their skin very frequently -- as often as once every two to six weeks. To do so, they either rub up against coral reefs or they tie themselves into a knot to provide the friction necessary to slip out of their old skins. While scientists have not yet documented the phenomenon in banded sea kraits, some sea snakes are able to absorb up to one-third of their oxygen requirements from the water, while others have skin that is permeable to water, but not salt. How Do Sea Otters Move?